Patrick Walters of Ladson, S.C. hoists the Bass Pro Shops Bassmaster Central Open trophy after winning the event June 16, 2018. Sporting his Phantom Outdoors cap from the Summerville-based outdoor apparel company, Patrick Walters of Ladson smiled as he hoisted the biggest trophy yet of his fishing career after winning the Bass Pro Shops Bassmaster Central Open on Louisiana’s Red River over this past weekend. Walters is no stranger to success at bass fishing tournaments. When he was a college sophomore, the angler and his University of South Carolina fishing partner Gettys Brannon won the 2015 FLW College Fishing National Championship. He’s had his share of other successes along the way. 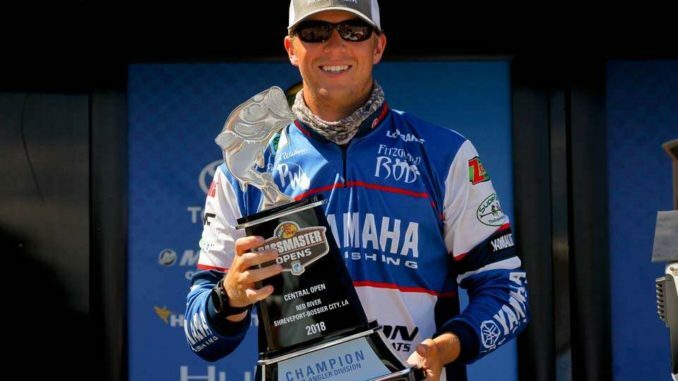 The win this past weekend gives him a shot at making the 2019 Bassmaster Elite Series roster and fishing in the 2019 Bassmaster Classic. Walters used an unconventional strategy during the Red River event, sticking to Pool 5, close to the launch area, instead of making long runs that are common in the tournament world. He opted for this approach based on three factors. For one, Walters wanted to get a full day of fishing in each day, rather than spend hours riding around and looking for new water to fish. “Optimizing time was my goal this week. Staying in one area allowed me to fish a full eight hours, instead of wasting time gambling, looking for new water,” he said. Two, Walters had fished here in his final college fishing championship tournament two weeks earlier, and all the tournament fish were released at the launch site. “All of the fish were released inside Pool 5 (right next to the boat launch) and did not have time to disperse back into the river,” said Walters. And third, Walters just didn’t have a lot of confidence in any other areas based on that previous tournament as well as during practice days leading up to the Central Open. Other anglers spent the first day of the tournament in Pool 5 as well, and Walters weighed in a small limit of 8-9, but he wasn’t discouraged and stuck to his plan, knowing the other anglers would spread out to other areas over the next two days. He was right, and vaulted from 23rd place to second place after day two as his total weight grew from 8-9 to 20-4. Saturday, Walters bagged another limit, this one weighing 10-11 to boost his final weight to 30 pounds, 15 ounces. He finished more than two pounds ahead of second-place finisher Drew Cook of Midway, Florida. Walters used a combination of soft plastic baits and crankbaits throughout the tournament, with Rapala DT 6 and Yamamoto Thin Senkos making up a good portion of his offerings. For the win, Walters earned cash, a boat package including a Skeeter ZX200 with Yamaha VF200LA, a custom trailer, a Minn Kota Fortrex, and a Lowrance Elite Ti 7. The win also secured Walters a spot in October’s 2018 Bass Pro Shops Bassmaster Opens Championship at Missouri’s Table Rock Lake, where he will compete against the other seven winners from each Open tournament, as well as the Top 10 anglers in point standings from each Open division. A total of 28 anglers will compete in that tournament, vying for spots on the Elite Series roster and entrance to the Bassmaster Classic. Brian Cope of Edisto Island, S.C., is a retired Air Force combat communications technician. He has a B.A. 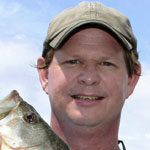 in English Literature from the University of South Carolina and has been writing about the outdoors since 2006. He’s spent half his life hunting and fishing. The rest, he said, has been wasted.